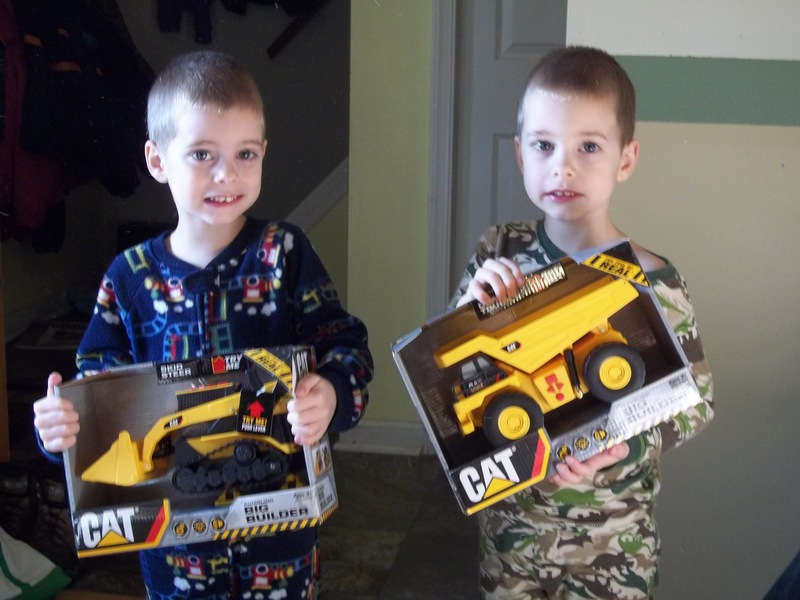 I can’t believe that my “babies,” my twin boys, are turning 6 this week!! Right now they are pretty much obsessed with anything related to guns, army, soldiers, etc. 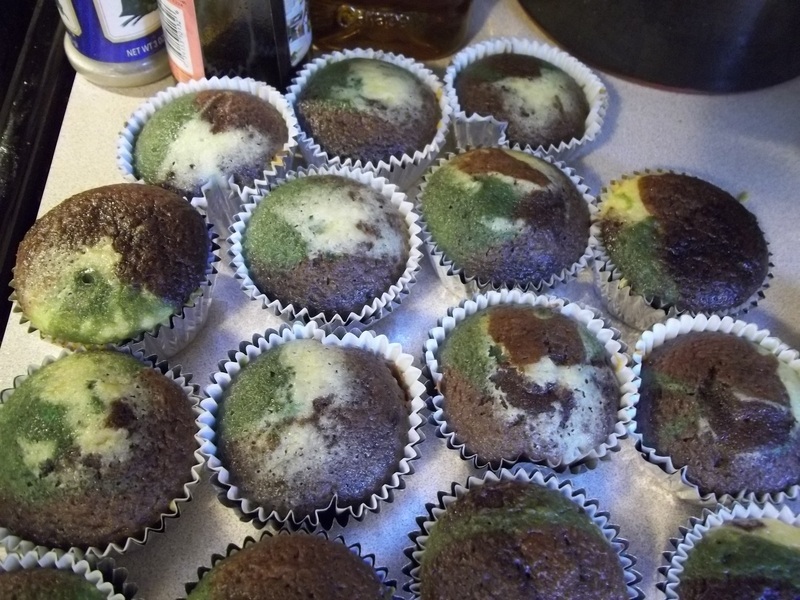 Sooo… I thought they might dig some camouflage cupcakes for their big day. 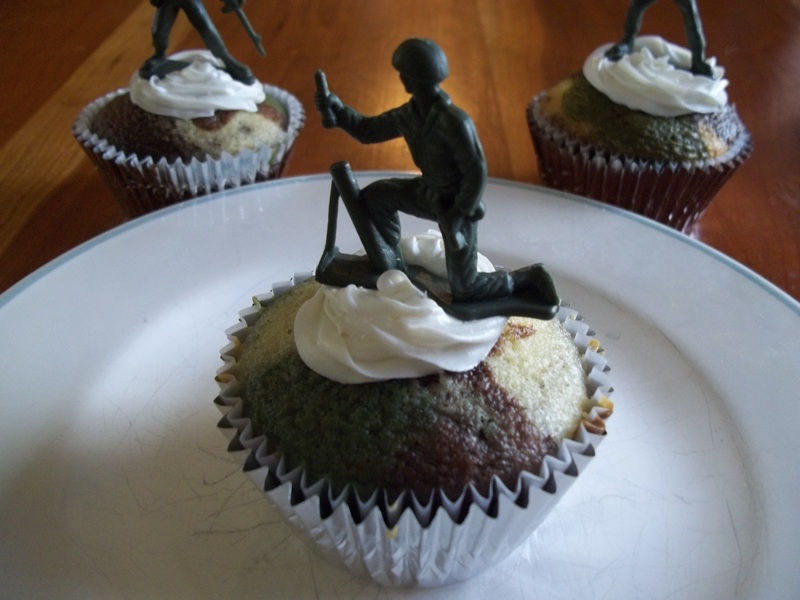 And what better way to top off a camo cupcake than with an army guy? I know tons of little (and big!) boys who would love these. 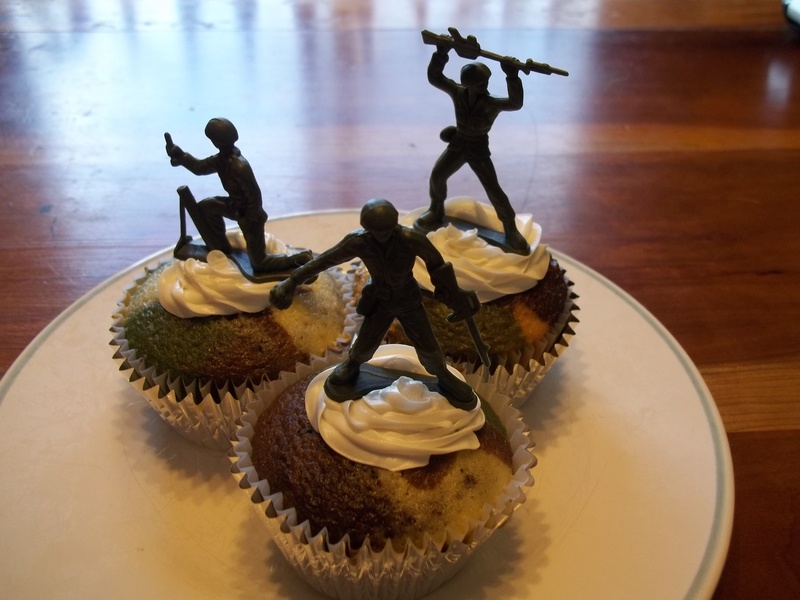 No girly or fussy cupcakes for these dudes! 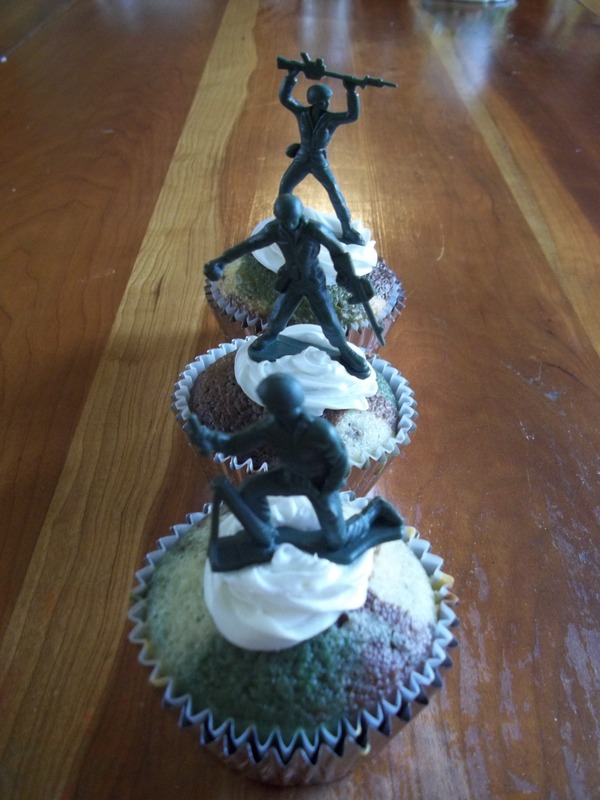 Here’s a little rundown of how I made these…. 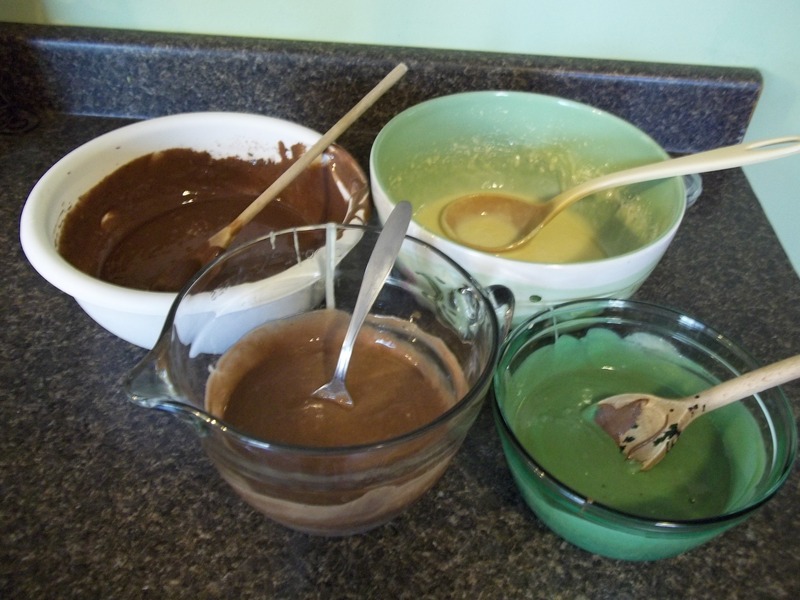 Start off by mixing a white cake mix in one bowl and a chocolate cake mix in a separate bowl. Line a bunch of cupcake tins with your paper liners. Once they’re mixed, set out 2 more empty mixing bowls. Put a spoon in each bowl. Now, to get the whole swirly, multi-colored camo thing going on, you’ll end up making 4 different colors/variations. In one bowl, mix equal parts white and chocolate. 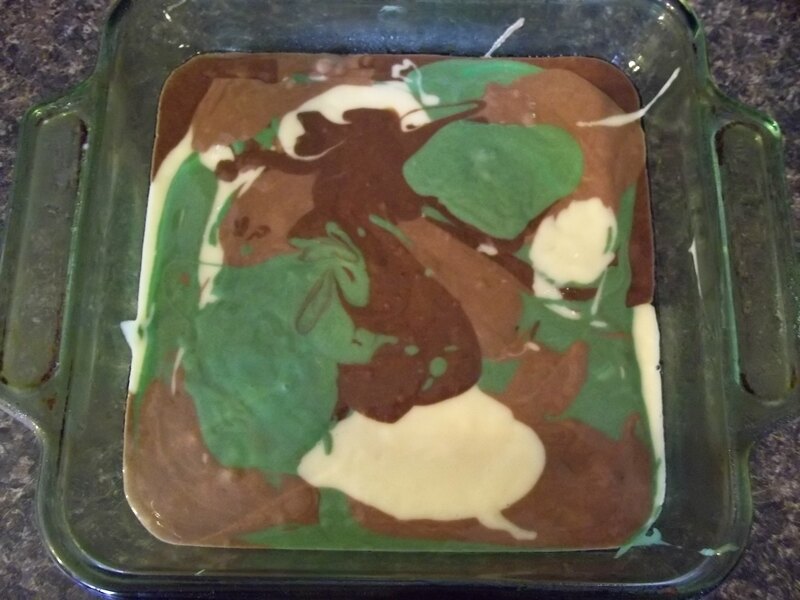 In the second, do white with just a bit of chocolate and add green food coloring. For the other two, just leave them plain chocolate and plain vanilla. 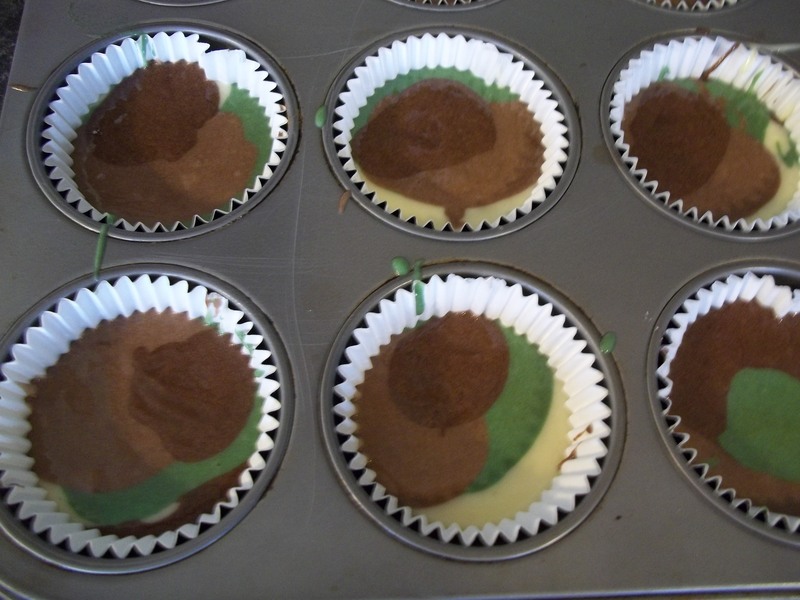 Now, simply add dollops of each color kind of randomly in your cupcake tins. Since I made two complete cake mixes, I had plenty of batter, so I took the rest and did a small cake as well, using the same method. Here’s what they look like fresh out of the oven. 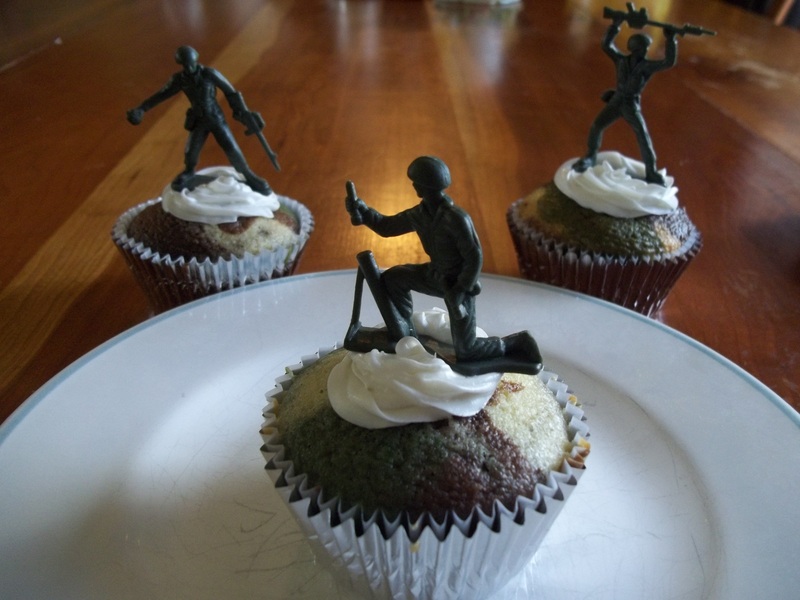 I think they look better with a swirl of icing, and of course, an army man! Happy Birthday to my littlest men! 1. Are they all yours? What I usually say, with a smile: Why yes they are. 2. Wow, you’ve got your hands full! What I’m thinking: If I had a nickel for every time I’ve heard that, I would be a wealthy woman. 3. Are you done yet? What I say: Oh yes. 4. Haven’t you figured out how that happens yet? What I do: Usually I just laugh. What I’m thinking: Um, yeah, we know. What I want to say: No, I have no idea. Can you tell me? 5. Don’t you people own a TV? This one is related to the previous question. Usually I just chuckle. By the way, people who have asked us this question usually think they are hilarious. 6. Did you always want a lot of kids? What I say: Yes, but not this many! 7. How do you handle all of them? What I say: I have different answers for this one. Sometimes I just make up something that sounds good at the time. What I say: Yes, they sure are. What I say: Yes they are. What I’m thinking or want to say: see #8’s what I’m thinking. 10. Holy cow, are there 2 sets of twins? I’ve sometimes gotten this one if Andrew and Heidi aren’t standing next to each other. This kind of cracks me up because they are the furthest apart in age. What I say: Nope, just one set. What I’m thinking: Thank God, no! 11. How do you tell them apart? What I say: I usually explain that I can just tell who’s who and that one of them has a chipped tooth. What I want to say: Oh, I mix them up all the time. Who knows who’s who at this point? 12. Do twins run in your family? What I say: Nope, they were a complete surprise. 13. Are twins more work than having one baby? 14. Whoa, that’s quite a brood/tribe/crew you’ve got there. Those are the main ones I get when I’m out and about. I have to say that I’ve gotten pretty used to these types of questions/statements and will usually politely respond to whoever is talking to us. Once in a while it is annoying and I feel myself mentally rolling my eyes. I’m sure other parents of multiples or parents of many get the same kinds of responses and can agree with me on this one. However, I do love having my brood/tribe/crew and wouldn’t have it any other way! Five years ago on this very day, I received some pretty significant, life-changing news. On this day in 2007, I got the completely unexpected news that I was having not one baby, but two babies. If there was ever a time in my life that I can say I was a complete basket case, that was it. It has since strengthened my faith in lots of ways. You see, I was the type of person who secretly pitied parents of multiples. I had even told friends and family that I was so glad I had only had one baby at a time and had no idea how those people did it. I’m sure the good Lord had many chuckles at my expense on that one! If you’re not familiar with my family, here’s what it looked like at the time: I had a 5 year old boy, a 3 year old boy, and a 1 1/2 year old daughter who had just started to walk. When she was a little over a year old, I was feeling ready to have a 4th (and last!) child, wanting to keep everyone semi-close in age. Actually, since I had so much fun with my little girl, and she was such an easy baby, I was dying to have another little girl. How cute would it be to have two little boys and two little girls, right? I got pregnant right away and was having a pretty normal pregnancy for awhile. At 20 weeks, our church’s preschool/kindergarten class was going on a field trip to a local crisis pregnancy center. They wanted to show the kids what an ultrasound machine looked like and, better yet, how cool would it be to show them a real baby on the ultrasound? Since I hadn’t had an ultrasound yet and I was the perfect gestational age to be the “model,” I was willing to have the kids see my baby on the screen. So, off I went, willing to bare my belly for a roomful of little people. We divided the kids into two groups, bringing one group in at a time. For the first group, the volunteer tech plopped the wand down on my belly, and there we saw a baby right away. Notice I wrote “a” baby–that’s because we only saw one. She pointed out the different body parts, not really needing to move the wand around much. Then the second group of kids came in, and again she plopped the wand on my belly and we saw one baby on the screen. Great, I thought, I finally got to see my baby once before my 26 week ultrasound. Well, soon after that I noticed some major changes in my pregnancy. 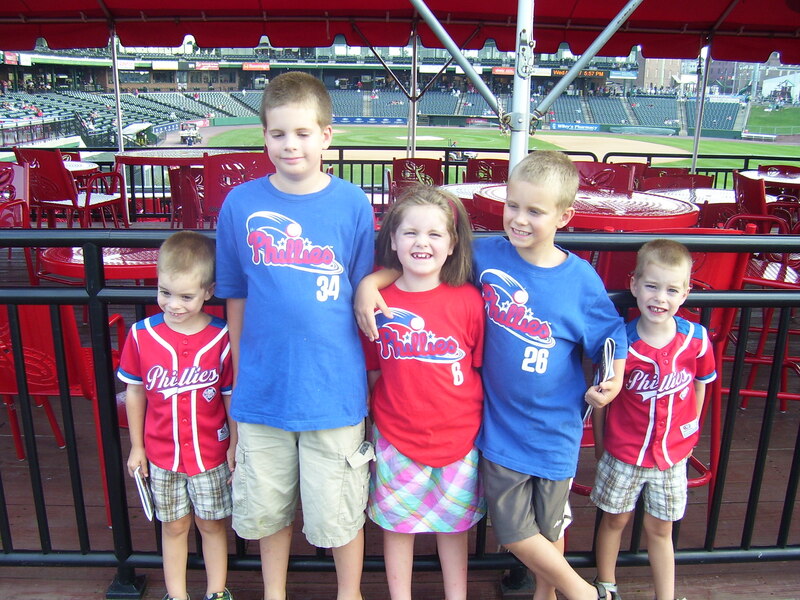 For one thing, I suddenly got HUGE–much bigger than I was with the other 3 kids. Also, I had about zero energy for being in my second trimester, when normally I would have all kinds of energy at that point. Oh, and did I also mention that this baby was way more active than the other ones? What in the world was going on? People tried to tell me that since it was my 4th pregnancy, I was bound to be bigger and more tired. Well, the day of my real ultrasound rolled around, and I was honestly a little nervous, thinking that maybe they would find something wrong. My husband stayed home with our other kids, as we didn’t want to drag them all along. Besides, I’ve had lots of these before, it’ll be no sweat. The tech this time, as she led me back to the room, asked me all kinds of background questions. How many other pregnancies have I had? How far along was I? How old are the other children? Do I have any medical problems? and so on. The room dimmed, warm gel was squirted onto my now watermelon of a belly, and she started with the wand down at the bottom. Right away we saw a baby head, so she said “oh, there’s the head,” then the wand was slid up a little to look at the baby’s abdomen. “There’s your baby’s belly.” As the baby’s abdomen came into view, something else came into view as well. “Oooohhh…” was the response. Then a pause. “You’re kidding me, right?” I said as I knew she most definitely was NOT kidding. I burst into tears. This could not be happening to me. My life was over. Lord, how in the world could you do this to me? I can’t handle twins! Good grief, and did you have to make it the 4th time around? And why oh why did I not find out until I was 6 months along? Then I laughed. And cried. And laughed. And cried some more. The poor woman probably thought I was nuts! The rest of the ultrasound went by in a blur of measurements for both babies. I took the two pictures printed out for me and, trying not to look like a complete mess, went out to my vehicle. I drove home in a stupor, many thoughts swirling through my mind. I do have to mention that I stopped on the way home for a milkshake–a very large one at that! Darn it, if I was growing two babies, I needed that milkshake!! I arrived home having no idea how I was going to break the news to my dear husband. He was upstairs on the computer, the other kids playing on the floor. “Um, well, it’s a good thing you’re sitting down.” I held out my two pictures, my hands shaking. “Not one baby. There’s two babies.” The tears came on again. For the next day or two, I really was a basket case. Lots of tears and having a big old pity party for myself. There were glimmers of joy but lots of “why me’s?” as well. How was I going to take care of all these little ones? Would I ever have any kind of life? How would we afford them all? What about my other kids, weren’t they going to feel completely neglected? Fortunately I had lots of people praying for me, once they heard the big news. Lots of calls, cards, and overall encouragement. I was reminded that God didn’t expect me to do this alone, which was very comforting to me. I soon got over my pity party, realized how blessed I was, and put my faith in God to help me through the upcoming challenging times. Now, looking back, I can tell you without a doubt that those two little boys were one of the best things to ever happen to me. I didn’t get the little girl I had hoped for, but God knows what we need and what’s best for us way better than we do. Joey and Josh are my little sidekicks, my littlest loves. I can’t ever imagine having one without the other. They will turn 5 at the end of March and I can’t believe they are not babies anymore. In fact, I’ll probably do another post in honor of their big birthday and some more posts about raising twins too. Oh, and before I sign off, I thought I’d mention another interesting fact in this tale. When I was lying on that ultrasound table, crying and contemplating my news, I noticed something that didn’t hit me until much later. You know how ultrasound techs and other medical personnel usually have their certifications, etc. framed on the wall? You want to know what the name of that tech was? In the last couple of weeks our family has reached a goal I never thought I would see. It’s one that years ago I swore I would throw a huge party complete with a bonfire once this goal was reached. What was I planning to burn in that blazing bonfire? Our diaper pail. That’s right, people. Our diaper pail. As of about 2 weeks ago, my youngest children finally got potty-trained. 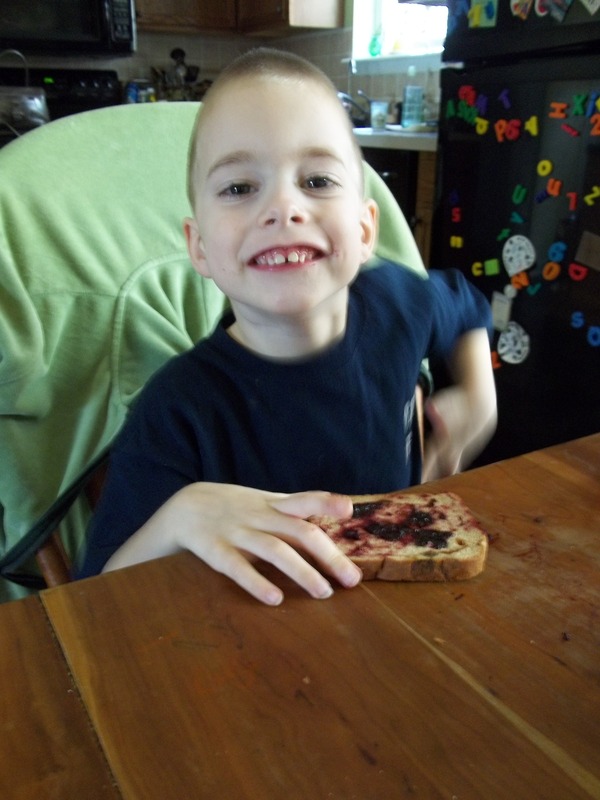 And yes, if you know us or are familiar with my blog, my youngest two just turned 4 years old. My oldest actually turns 10 next week, so we were deep into diapers for nearly an entire decade. Not only that, but the last 8 of those years I have had at least 2 in diapers at a time. Actually, several of those years I had 3 in diapers and for a short while after my twins were born, I had a whopping 4 in diapers. Crazy, huh? Now you know why I thought I would never see this day arrive. Now you also know why I am doing a post strictly on potty-training. It all of course started with my oldest son, Daniel. At 3 he was a very difficult child and really could care less about the toilet. I voraciously read about and tried out the various methods listed in every parenting magazine out there. Nothing worked. It seemed as if every child within his age range was happily peeing and pooping on the potty for their proud parents. My Mom, God bless her, had read about the whole Cheerios peeing trick for boys online and really thought she was going to get him to go. Well, she dropped the Cheerios in her potty and had Daniel come in to see what a cool game Grandma had for him. Guess what? That child screamed and screamed “My Cheerios! My Cheerios!” I was completely fed up by then and vowed to give the potty training a rest for awhile. Clearly he was NOT ready to do this. At his 4 year old check-up (which, by then, he had 2 younger siblings) I was at my wits end and vented to our pediatrician. No, he didn’t scold me for not having my child potty-trained. He assured me that it would happen anytime and he would bet that it would just happen one day and that would be that. Well, guess what? That man was right. One day my son up and decided to use the toilet and that was that. One day. Done. With my next oldest, Andrew, it was pretty much the same story. I tried a bit at 3 years old to no avail. This time around I was a bit more relaxed and didn’t push him too much. In fact, the more I pushed, the more he resisted. So again, I gave it a rest for awhile. Then I was pregnant with my twins and barely had the energy to deal with it anyway. Soon after their birth was when he, Heidi, and my newborn twins were ALL in diapers. I remember actually lining them up in a row like a little assembly line to change them. I know that sounds insane, but it really wasn’t that bad. 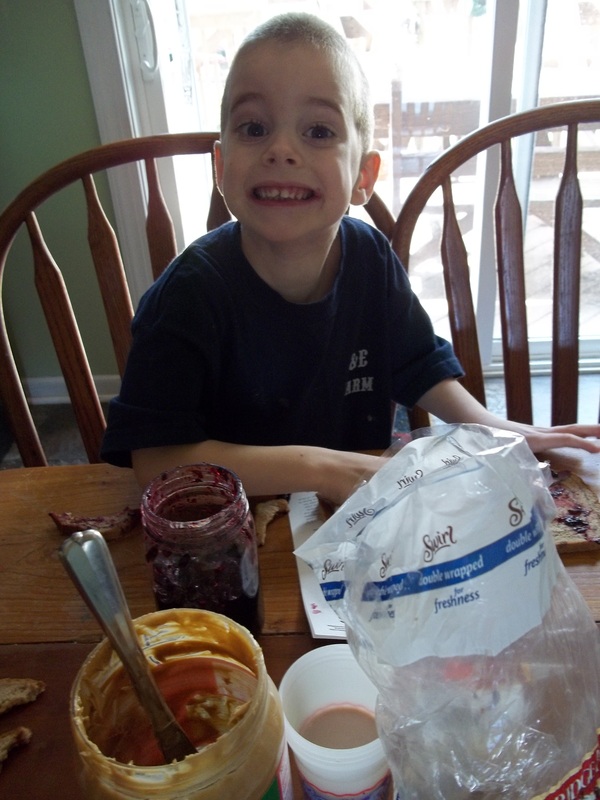 Andrew turned 4 and did pretty much the same thing as his big brother–started using the potty in one day and that was that. Now, my daughter was a bit easier. Out of all my kids, she is the one who cared a little more than the boys. At 3 she was not speaking much (she had a speech delay and was delayed with her gross motor skills) but did have some interest in the potty. Actually, at a little over 3, I almost had her trained while we were on vacation. The evening we came home the poor girl fell off of our front landing and broke her leg. She was placed in a full leg cast and I had to put her in diapers again. Until she was out of the cast, she was not into using the potty. So, again I had to be patient and wait for her to be a little more ready. Heidi also trained in about a day a few months before she turned 4 years old. That brings me to the twins. Potty training twins was not as difficult as it sounded. They usually went at around the same time, so that helped. Like my other boys, they could absolutely care less what kind of nastiness was going on in their diapers or pull-ups. Also, putting cloth undies didn’t really work for any of my boys. I did try with all of them. Seriously, they would walk around with them wet or stinky and not even care. So, I took the laissez-faire approach and decided it would happen when it would happen. If they showed interest, I would be all over that. If there was major resistance, I would let things be for awhile. At my family’s Mother’s Day picnic my one grandmother completely gave me grief for not having them trained. Needless to say, I was a bit ashamed but also kind of angry too. I kindly told her that it was going to happen anytime and I wasn’t too worried about it. “I’ve been doing diapers for this long, what’s another month or so?” was my reply. So, when they up and got trained a couple of weeks ago, I did not call her and gloat. I simply gave my boys lots of encouragement for being big boys and enjoyed not buying diapers. So, here we are, a diaper-free household. The pull-ups are still around, but I’m sure they will be by the wayside soon as well. Now, you may have read this and thought about what a terrible example I may be to the potty-training world out there. Or, like I mentioned earlier, you may be tearing your hair out in frustration and this will make you feel a little bit encouraged. You are NOT a failure if your child is not using the toilet yet. Really. I promise you, you WILL get there someday, just like us. Really, I never thought I would see this day arrive. Our diaper pail was such a given part of our household. Now, who wants to come to a bonfire party?